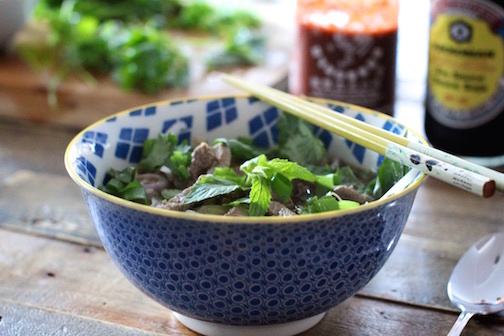 Hey, Lady Grey: Make your own Pho - it's easy, pho real!! Make your own Pho - it's easy, pho real!! Pho, if you don't know, is a delicious Vietnamese noodle soup (also known as Tonkinese soup). I don't know if it's popular in every big city, but it's pretty huge here in Montreal. It's served in wonderfully oversized bowls and topped with generous handfuls of fresh herbs and lime. We lived off the stuff during our medical training - it is deeply satisfying. 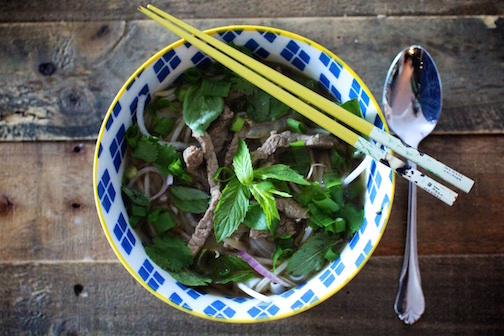 And it turns out, really good Pho is actually really easy to make at home. You'll need to buy some cinnamon sticks, star anise & fish sauce to make that authentic tasting complex flavoured broth. But it is so worth it! 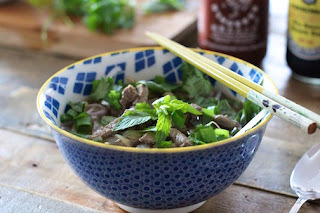 The following recipe is for classic Pho Bo (beef noodle soup), but you could easily make it vegetarian by swapping the beef broth for good quality veggie broth, and the beef for thinly sliced tofu. Recipe adapted from Inviting Asian Flavors - Company's Coming, Practical Gourmet. Cover noodles with hot water and let stand, covered, for 25 minutes (or until softened). Drain noodles and divide among 4 large serving bowls. In a large pot, heat oil over medium-high heat. Add onion and cook until browned, about 5 minutes. Add water, stir & scrape off any browned bits off the bottom of the pan. Add the broth, cinnamon stick, ginger, and star anise. Return to a boil, then simmer for 15 minutes on low. Then discard the solids, keeping the broth. Then add in the thinly sliced beef, sugar, fish sauce and soy sauce. Stir until the beef is no longer pink (only takes a few minutes). Add a handful of bean sprouts to each bowl of noodles, and sprinkle with red & green onion. Cover with broth and a few pieces of meat. 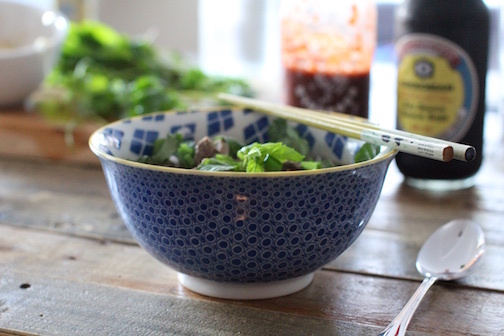 Serve alongside a generous platter of fresh herbs (thai basil leaves, cilantro, & mint leaves), lime wedges, and sliced chili peppers, as well as sriracha sauce & soy sauce, so that everyone can customize their own bowls. Thanks for this post Queader! Now I've got to get on and implement more thank you..
Noodles Can I take the recipe?